This is another one of the pretty old sections rpg-o-mania has to offer. 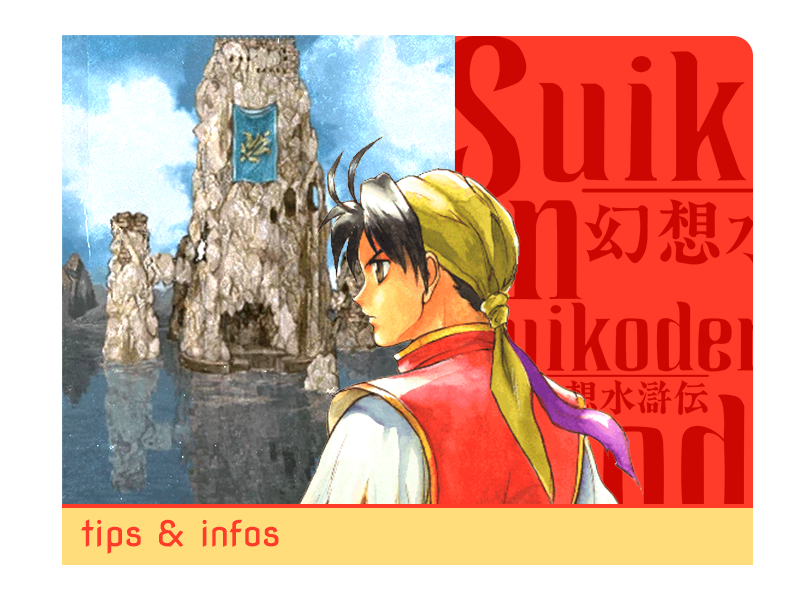 It's basically some tips I found out back in the day when playing Suikoden and I put them online. This is not comprehensive, but this information belongs to this site and so it is here! Please be warned that there are spoilers! You may have wondered what reason the binoculars have you get from Ivanov when he finished his mural. After you got them, you can change the camera angle in battles with pressing the triangle, square, circle or X Button on control pad 2. Well, the "special" ending is not really special, and it's "simple" to get. Just have all the 108 Stars of Destiny recruited (Pahn and Gremio alive) and the very end of the ending will be different. Pahn will meet General Teo in the middle of the game (approximately) and is forced to fight him in a "one-to-one-battle". You will probably lose, but you mustn't! If Pahn dies, Gremio cannot be saved! To win the battle, Pahn should be at least level 35. And you should know what attacks Teo is planning... check the table below to win the battle! · All of the other stars are alive (meaning no one died in Battle) · You got all characters before the final big "army vs. army" battle against Yuber. If you meet these prerequisites, Gremio will be revived before the last battle.